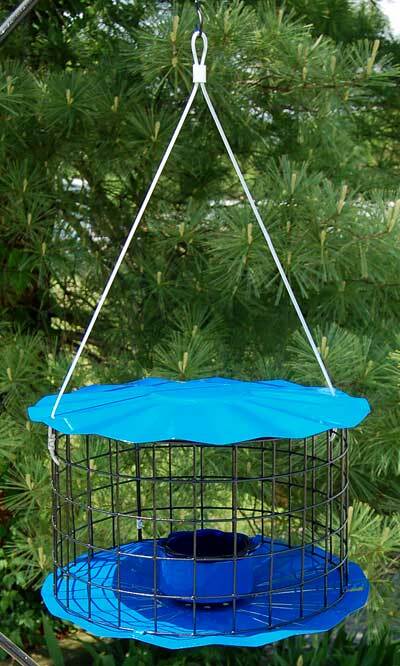 Create a bright feeding haven for bluebirds in your yard with this Erva Blue Caged Bluebird Feeder. The vivid blue top and base of this fantastic feeder are sure to add a bold look to your yard, while inviting select birds to dine. A deep blue, glass dish rests in the center of the frame, easily holding 0.5 cups of jelly, mealworms, seed, or oriole nectar. Vinyl coated wire forms the sides of the feeder, and the 1.5" square openings often prevent larger birds and squirrels from reaching the food. Place fruit or suet on the base, 14" diameter tray for feeding a larger variety of birds. The glass dish removes in moments for quick refilling, and the feeder may be fully disassembled for in-depth cleaning. Its powder coated, galvanized metal tray and roof ensure durability for seasons of service, and the plastic coated cable makes it simple to hang this unit. Offer select birds a striking feeding spot with this Blue Caged Bluebird Feeder. Made in the USA. Achla Heavy-Duty Single Shepherd Hook, Graphite, 7'9"
Pine Tree Farms Le Petit Mealworm Banquet Seed Cake, 12 Pk. Songbird Essentials BirdBerry Jelly, 20 oz.